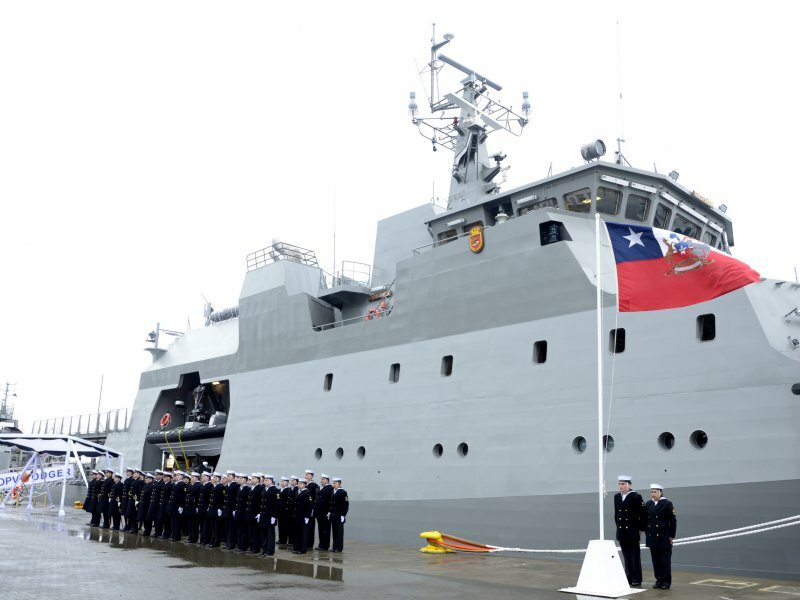 On last April 1st, was christened the third Fassmer-80 OPV for the Chilean navy. Named “Marinero Fuentealba” after a sailor who died trying to rescue the crew of a stranded ship on a storm in 1965, the new OPV will be delivered to the Navy in August 2014. This is the third ship of a class of five for the Chilean navy, which are built in the ASMAR shipyard, Talcahuano, Chile, a German design selected among several bidders (Fincantieri, Vosper Thornycraft, Kvaerner Masa Marine, Damen and Fassmer). The detailed engineering was done by ASMAR which did 50,000 hours of modeling on the ships’ systems and components. 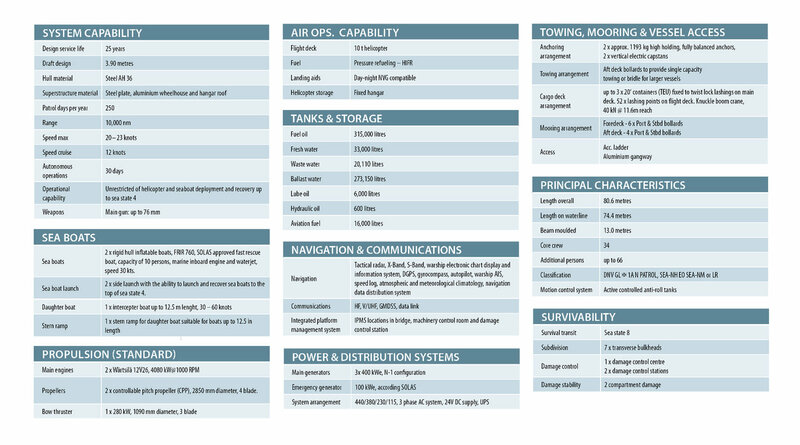 The ships are classified as LRS +100 A1 LMC UMS. The original design was modified in several aspects, most importantly, the addition of a hangar for a medium size helicopter. With an overall length of 80,60 meters (264′), a waterline length of 74,40 (244′) and a moulded beam of 13,00 meters (42.6′), the Chilean Fassmer 80 OPV have a full load displacement of 1728 tons. With such a displacement, at 12 knots, their range is 8.000 nautical miles with accommodations for 60 persons including 20 passengers and the helicopter crew. The endurance is 30 days, carrying 298 m3 of fuel oil, 48 m3 of fresh water and 20 m3 of helicopter fuel. Two 12V26 Wärtsilä engines, delivering 4.080 KW (5,471 SHP each) @ 1.000 rpm, work on two 4 blades controllable pitch propelers. At 80% MCR the speed is 20 knots. The first 2 ships are armed with a 40 mm gun taken second hand from German Type 148 missile boats, and with up to six .50 machine gun, although normally four are embarked. The third ship, the “Fuentealba” will be armed with a 76 mm Oto Melara gun also from a Type 148 missile boat. Some sources indicate its secondary armament will be up to 6 x 20 mm guns (probably old Oerlikon 20mm/70). This third ship has an ice strengthened hull and a different communications set, details have not been released yet. With these modifications “Fuentealba” will cost 43% more than the first two ships of the class, whose cost was less than $50M US each. The flight deck and hangar are optimized for medium helicopters. Normally an AS-365 N2 Dauphin helicopter, similar to the MH-65, will be embarked. Typically it will be used for MIO and rescue operations. There are two single points davits for two locally built 7,40 meters RIBs which can be launched and recovered while sailing at up to 12 knots. Under the flight deck is a working space with enough space for up to three 20 foot container sized units. There are four hatches in the flight deck permitting an easy access to the work deck. It is served by a Palfinger Marine PK 60000M crane installed on the flight deck. On the work deck and stern are the necessary fittings for towing other ships, towing being one of the main mission of this class of ships in Chilean service. Notably the second ship in the class (OPV 82 “Toro”) has, on the stern, 2 racks for depth charges!! Although an old weapon, several Chilean navy ships have been equipped with depth charges, as useful weapons for warning shots against submarines. The Chilean Fassmer 80 OPVs have a Sperry Marine integrated Bridge System, an integrated communication system and an unmanned machinery space, remotely controlled. They are also equipped with the Mobile Maritime Command and Control System “SMC MM” and the ARIES fire control system for the 40 mm gun. Both systems are developed locally by SISDEF and DESA CHILE. 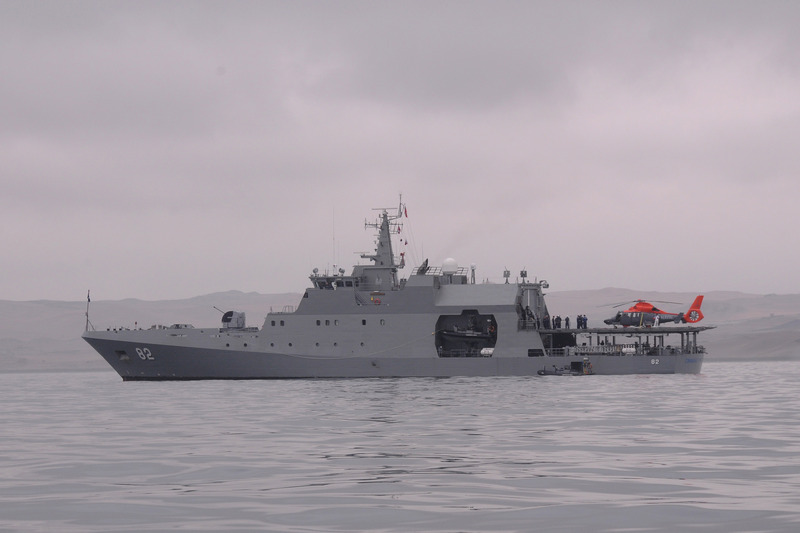 It is most probable that the “Fuentealba” will be equipped with the SAETA fire control system, developed by DESA CHILE for the Chilean SA’AR missile boats armed with 76 mm guns. The Chilean OPVs are operated by the Dirección General del Territorio Marítimo (DIRECTEMAR), a special branch within the Chilean Navy. The missions carried out by this ships are: coast guard, fishery protection, search and rescue, contamination control, training and support of isolated communities. 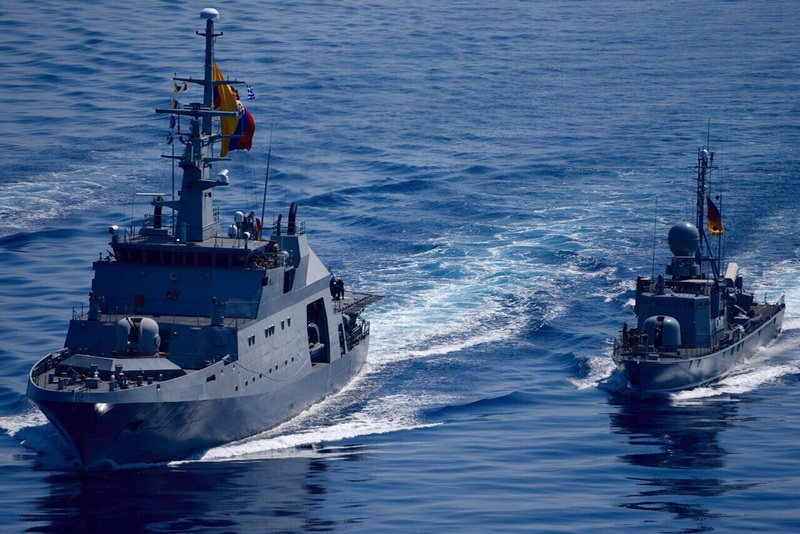 Nevertheless, the first two ships have also deployed to international exercises and operations, such as UNITAS, PANAMAX and MARTILLO, the last one in combination with forces of the US Southern Command for fighting drugs smuggling in the Caribbean. 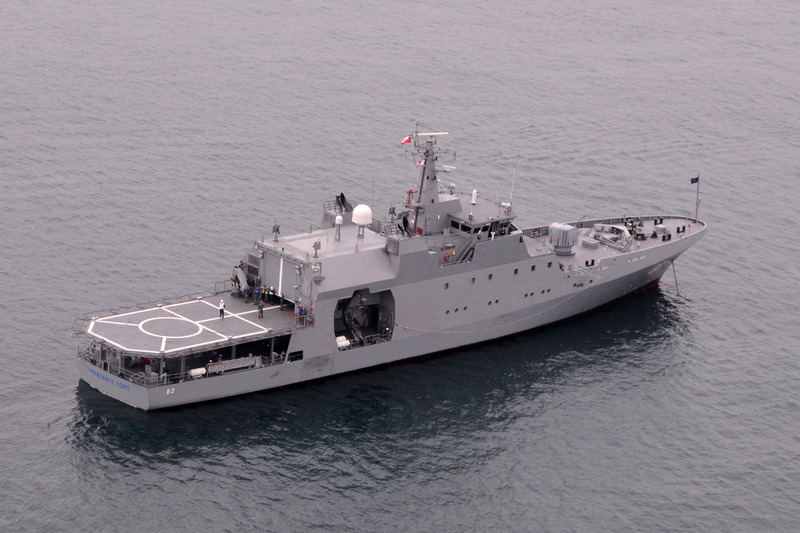 The Colombian navy has received 2 slightly modified ships build locally by COTECMAR and has contracted a third ship, planning to build as many as 6, for operating 3 in the Pacific and 3 in the Caribbean (Argentina is also planning at least four-Chuck). Main modifications are a different mast, a different 40 mm gun, a telescopic hangar for a Bell 412 helicopter and a stern ramp. The stern ramp was considered less important for the Chilean Navy, which opted for improved towing capacity of towing ships and additional space for supporting isolated communities rather than the improved ability to deploy a boat quickly when chasing “go-fast” boats, since this is not a threat in Chilean waters. The OPV “Fuentealba” will be deployed to the Third Naval Zone, with homeport in Punta Arenas, on the Magellan Strait. Photos provided Andres Tovalari. 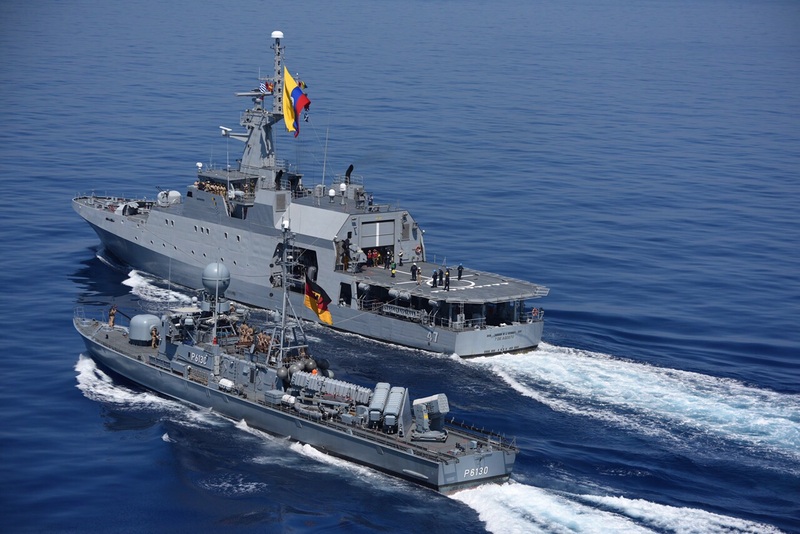 Colombian Navy OPV “7 de Agosto” sailing along a German Navy missile boat. Ship is currently part of Operation Atalanta countering piracy in the Indian Ocean. It is less obvious, but she also has a stern boat ramp as well. This entry was posted in International, News, Operations, Shipbuilding, Ships and tagged A, Chile, Colombia, OPC, OPV, rgentina by Chuck Hill. Bookmark the permalink. Super ships. I have mentioned them over at Think Defence on several occasions. I wish we were getting these and not the BAE design for our new “make work” OPVs that will plug the gap between the end of CVF production and the start of the T26 builds. 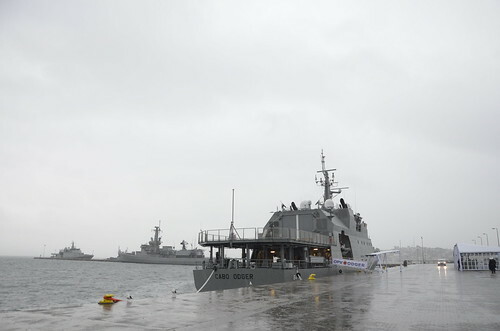 From the German Navy Blog Marine Forum (http://marineforum.info/Daily_News/daily_news.html), 6 Nov, “CHILE, Third PILOTO PARDO class offshore patrol vessel, MARINERO FUENTEALBA, commissioned during ceremony at Asmar shipyard in Talcahuano … will be based in Punta Arenas (3rd Naval Zone)” This is the vessel that was ice strengthened and better armed than the first two on the class. Actually these are almost ideal ships for counter piracy, but that problem, off the Horne of Africa, is largely resolved. They might have done more for good will by volunteering to help with Migrant problem in the Med. I’ve added an addendum to the original post with some pictures from the original author of one of the Colombian OPVs of this class, along with info on its armament (see at the bottom of the original post above). Expected cost is about $200M (US) each. “Regarding OPVs, Honduras is buying one Fassmer 80 from colombian Cotecmar shipyard. (additionally is buying also a small LSM). I have also added a new photo to the end of the post. State-owned COTECMAR shipyard has begun designing an offshore patrol vessel (OPV) larger than current 1,800-ton 20 DE JULIO class vessels … to meet a Colombian Navy requirement for patrol ships with greater range for extended open-ocean patrols in the Pacific. The author sent me a bit of an update on what Chile is doing. 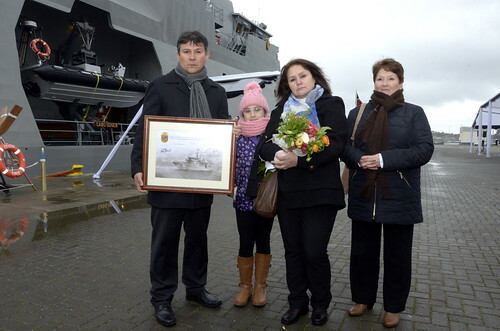 “I want to tell you that one year after being christened, the OPV-84 Cabo Odger was delivered to the Chilean Navy. As announced in the web page of the Defense Ministry http://www.defensa.cl/noticias/cabo-odger-construido-en-asmar-presencia-fiscalizacion-y-vigilancia-para-la-zona-norte-del-pais/ and the Chilean Navy web page https://www.armada.cl/armada/noticias-navales/armada-cuenta-con-nuevo-buque-para-reforzar-los-patrullajes-maritimos-en/2017-08-10/151022.html, Cabo Odder is the 4th vessel of a 6 ship class, known as “Danubio IV”. (Danubio I, II and III was the construction of 16 Fairey Brooke Marine “Protector” patrol crafts). Cabo Odger’s full load displacement is 1771,6 ton, exceeding OPV-81 Piloto Pardo and OPV-82 Comandante Toro, whose full load displacement is 1728 ton. Like the third ship in class (OPV-83 Fuentealba), Cabo Odger is armed with an 76/62 gun, has an ice strengthened hull and costed 70 million dollar. But Cabo Odger has a different communication suite, which was not specified. It just was said that the new communication suite was different and more secure. Cabo Odger’s missions are patrol, surveillance, jurisdictional waters maritime control, maritime search and rescue, pollution control, maritime signaling maintenance support, isolated locations logistic support, maritime police, “command and control of a defensive task force” (honestly, I don’t know what that means) and auxiliar transport. Although her ice strengthened hull, she will be based in Iquique. The OPV Odger is equipped with a Terma naval radar, as can be seen in this video: http://www.tvu.cl/prensa/tvu-noticias/2017/08/10/bachelet-nuevamente-visita-talcahuano-sin-referirse-al-tercer-dique-de-asmar.html (Minute 2:32). It is a significant departure of her sister ships which are equipped with up to three Sperry radars. Thank you, Andres, like the fact the gun is located a deck above the Foc’sle. That should protect it somewhat from heavy seas. That is different from the previous ships I see. I guess this solution was found not just for weather protection, but also as a way for avoiding the deck penetration of the ammunition carrousel and so avoiding to many changes to the original design. Thanks, I had not noticed that. Radar aside, there are other differences between OPV-83 “Marinero Fuentealba” and OPV-84 “Cabo Odger”. Notably, life rafts on the working deck (under the flight deck) and on the RIBs caves, were move to a new position above the hangar, freeing room on the sides of the ship. On this picture of OPV-81 “Piloto Pardo” you can see three white life rafts: one on the working deck and two on the RIB cave. And none on the hangar roof. On this picture of OPV-84 “Cabo Odger” you can’t see any life rafts on the RIB cave. (The people on the picture are relatives to “Cabo (corporal) Odger” who died on August 15, 1965, in the same accident as “Marinero (seaman) Fuentealba”. Both of them lost their lives rescuing other shipmates). On this other picture of OPV-84 “Cabo Odger” you can’t see any life rafts on the working deck (under the flight deck). Finally, on this picture of OPV-84 “Cabo Odger” you can see several gray life rafts on the hangar roof. I wonder why such spaces on the side of the working deck and RIBs caves can be so important. The ship is getting additional weight very high – actually on the hangar roof – apparently just for winning some room on her sides. And in the three previous ships it seems that this room wasn’t relevant! According to the Spanish-language website InfoDefensa, the vessel features several improvements over its two predecessors, ARC 20 de Julio and ARC 7 de Agosto. It has an upgraded armament with a 76 mm OTO Melara gun and a 25 mm M242 Bushmaster auto-cannon. The Chilean Navy has awarded a contract worth USD60,000 to local firm BZ Naval Engineering for the upgrade of the Northrop Grumman Sperry Marine’s VisionMaster FT integrated bridge command system fitted on board its four Piloto Pardo patrol ships.